You are here: Home / Featured post #1 / The Forum is New. These PUPPIES are NEWER! When you’re only one hour old…..! I have had a lot of new things happening this month! We’ve just finished the FIRST MONTH of the Community Forum — and wow! So much has happened there. It’s been an incredible busy month there, that’s for sure. More stories about that later. I have another story to tell today! Also this month, as you can see by the picture above, I have had the wonderful privilege of having six of the most sweetest beautiful baby puppies join my life. Oh, be still my heart! These little fuzzy bumpkins are just too cute for words!! Lots and lots of people like puppies so let’s start there today. The pups in the picture are the two oldest boys. The one with the white — who looks like his daddy — was born first. 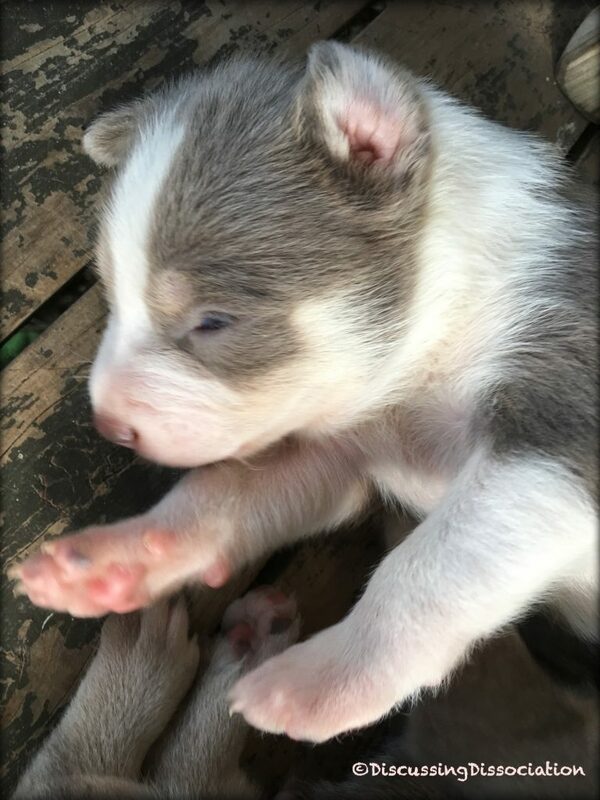 The silver nosed boy looks like the momma, Pinky. These two big boys were born just 15 minutes apart. So … yep! January 7, 2019 — Puppy Day! 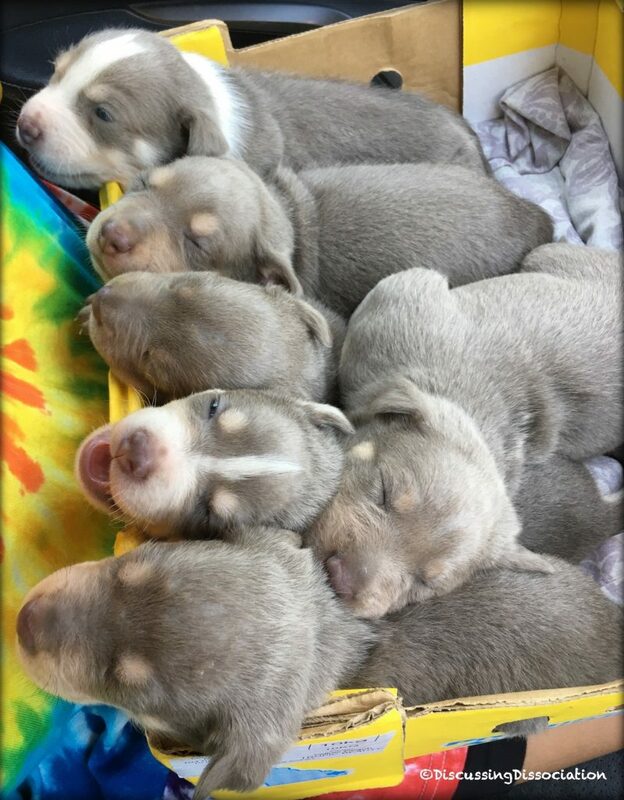 I spent the whole day being a puppy midwife, lol, and I can happily announce that now six gorgeous baby pupcakes are living with me. Right now, these little babycakes are sleeping on the floor, next to my chair right now as I’m typing. Four boys, two girls, all waving “hi-hi-hi” to you. They could look like three sets of twins, because each puppy has one other puppy that is very similar to them in size and color. Do you see their little pink nose and toes? They are bright pink when they are first born. The color changes later, but the pink is soooo pretty in these early days. And their fur is such a bright silver. That’s why they are called silver kelpies. They don’t stay quite this silver as they grow older, but they certainly do start out being very silver! Oh my goodness — puppies are just so totally awesome! There are few things in the world more fabulous than baby puppies. I love to hold them, and to cuddle them up close. I can’t help but feel happy-happy-happy when I’m holding a tiny baby puppy! When they are little like this, they love to sleep all snuggled up together in little puppy piles. They cry if they can’t find each other, or if they get roll off by themselves, even only a few inches away. They feel safest when they know exactly where their brothers and sisters are. Mostly they like their mommy though. They think she is the best-best-BEST in the whole world! One day old! So so tiny! Oh, wait. One more new introduction! I also met a new little frog this month who was pretty adorable too. Because frankly, little froggie was fabulous enough to get a special mention. This little guy was really brave. He (she?) let me walk right up next to him and he didn’t jump at all. ps: Don’t worry! 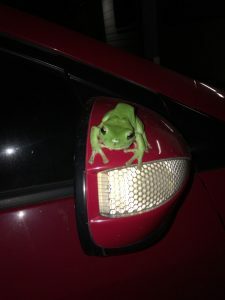 He was safely and gently removed from the car by a brave frog-holding person before the car was driven. 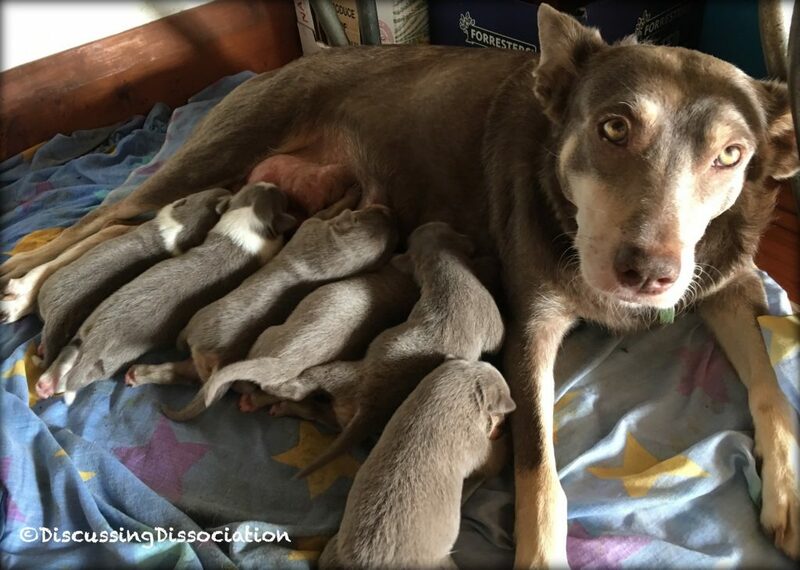 Of course, the puppies have grown and grown and grown — the momma dog, Pinky, has done a fantastic job taking care of the puppies. She has stayed very close to them and has kept them safe and warm. And they are definitely well fed! The puppies were initially about the size of an eggroll, with tiny little legs, and a tiny little tail. They do lots of eating and sleeping, so now they have grown to this size. Pinky Momma looks a little tired and worn out in this picture, but that’s because she was spending all day every day — every single day — with the puppies. She is working really really hard at taking super good care of them! She wouldn’t leave her little den, and she was very devoted to being with her babies. I brought food and water to her because she didn’t want to go even one step away from her babies. Isn’t that incredible?! Do you see the little den we made for the puppies? Pinky likes to sleep underneath this funny old table, so we blocked off the edges with a bunch of boxes and made a beautiful little den for Pinky to snuggle in safely with her puppies. Pinky could still see out, but no one else could get in. The puppies weren’t in any danger anyway, but Pinky still wanted to make sure that she kept them super safe! For the longest time, these funny little puppies looked a little bit like little mice, lol. 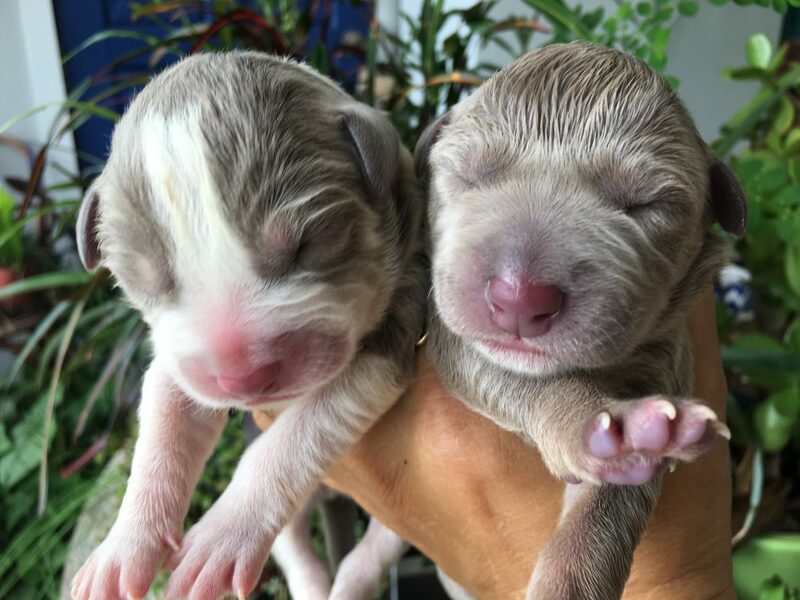 But finally, at two weeks old, the puppies began to open their eyes. For the first two weeks they were born, their eyes were shut, and their ears were tucked in. But at that 2-week place, their little eyes started to peek out to see the world, and their little fuzzy ears began to flap. OH, everything is different now! Remember that little puppy who was only an hour old? Here he is again, at two weeks old. See all the changes already! two weeks old! Peeking out for the first time. ALL the puppies are growing, and growing and growing! They eat lots and lots of time every single day, and all of them have their eyes open now. They are still learning how to walk, but apparently it is much harder to walk forwards than it is to push backwards. These funny little puppies. They roll around like wiggle worms and scoot themselves backwards all over the place. In this picture, you can see one little puppy singing. She’s a little girl, and she is the youngest puppy of them all, and boy oh boy, she does a LOT of puppy singing. She has a LOT of stories to tell! They still don’t have any teeth yet, but they are growing tiny little whiskers! Do you like their little pretty eyebrows? There have been lots and lots of new people in my life this month! How do you feel when you meet new people? How do you feel when you get to be with a tiny baby puppy? What makes your heart smile more than a baby puppy? I hope this little puppy update is fun for you and your kiddos! Speak with you again soon, and I hope you have enjoyed getting to meet someone new this month too! That’s all my little ones screaming with excitement. What a joyous start to the New Year! Thank you for sharing your little fur muffins with us Kathy. Shy … very, very shy. Happy … very, very happy! Well, my little one Squirrel would say baby kittens (she is obsessed with kittens). All the rest say that it is a tie with any baby animal. Oooooooh! Ahhhhhhhhh! Ohhhhhhhhh! Lucky you, Kathy! 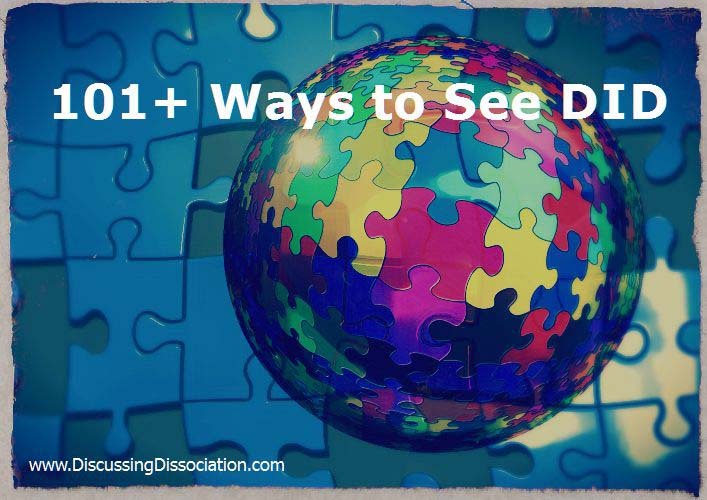 How do you feel when you meet new people? Depends who’s out front, where and when. I can be charismatic and gregarious. Or I can be shy and kind of quiet. I can feel very nervous and talk too much. Happy, happy, happy! I LOVE puppies! One heart for Mama and Kathy and six hearts for the puppies! Sending hugs! Oh my goodness…I just saw these beautiful puppies!! I never saw such tiny new puppies only few weeks old puppies, but I remember being there when my sisters cat had kittens. And they are so sweet, soft, and squishy…just want to hug them all and give then so much love! I’m more of a dog person though cause they usually are better cuddlers and that’s what I like to do. I love how puppies smell too and new human babies. I’m so happy you shared your bundles of squish with us!!! When I meet new people I’m usually quiet and kind and watchful but every once in awhile I’m very outgoing and talkative, I guess it depends on who is more up front. Holding a new baby puppie makes me feel so much love and warmth that just pours out of my heart! And protective, they are so tiny And defenseless they need protection. I don’t know that there’s much that can make my heart smile more than babies…baby anything’s! Thanks again for sharing your babies here, they are absolutely beautiful and mommy is doing such a great job! The puppies are very adorably cute! Baby animals make me believe there is hope left in the world. Everything is fresh and new! How do you feel when you meet new people? Usually I am happy to meet them. How do you feel when you get to be with a tiny baby puppy? Love holding puppies! Animals make my heart sing. What makes your heart smile more than a baby puppy? A baby human. What will you do with all this cuteness? Will you adopt them out? I couldn’t image loving and watching something grow for 6-8 weeks, then saying good bye to it. Do you Grieve the loss ? When it’s only been a short wile? Or is it the same as when it’s been apart of your life for years? How do you feel when you get to be with a tiny baby puppy? happy. loveing. What makes your heart smile more than a baby puppy? holding a real baby. and rocking a baby to sleep on our sholder. Oh my goodness!!! Those are the sweetest puppies I have ever seen!! 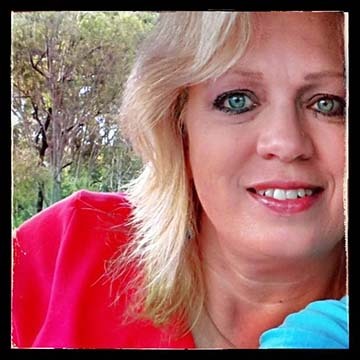 (With the exception of labrador puppies–my favorite breed!) Still, the silver is amazing! When I was a kid (very long time ago!) we raised miniature schnauzers, so we had 4-5 litters from two different mama dogs. My dad would sleep all night next to the den he had made for the mama dog when she was in labor. You are so lucky they were born during the day! 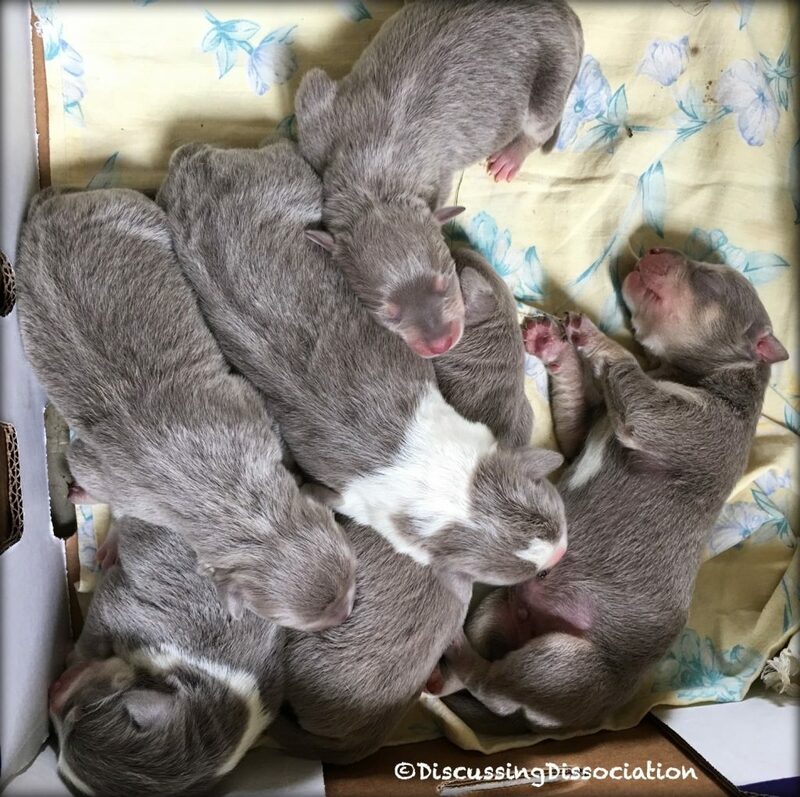 Did the mama dog know enough to lick off the placental sacs, or did you have to help? It must have been so cool! When we meet new people, we usually feel shy, but don’t always act that way cuz we know that if we ask them questions, and they talk about themselves, they feel more at ease and we can find something in common usually. Tiny baby puppies are the most precious things going! I want to protect them and love them as much as their mamas do! It’s a toss up as far as what makes my heart smile more–puppies or the little kids 1-4 year olds at church! They are a hoot to watch from the choir loft where we sit. Thank you for sharing the pictures with us! First I will read the body language. That will tell me which one of us can interact. I don’t stick around . I will get one of the littl. I love the puppies because they are critters – I feel safer with critters…..but their “littleness” really scares me….WAY too vulnerable….WAY too defenseless…..WAY too dependent with no choice or input as to who would be “taking care” of them….how do they know if it would be a “good” person or a “bad” person who would be there …if it was a “bad” person, they would have to just let stuff happen……Better stop with that…getting freaked out here…..
Meeting new people? Have a hard time with it when it is face to face….REALLY busy checking out body language, voice tone, facial expressions – OR I am just numb and disconnected….although I HAVE found I have a least 1 part that is too naively trusting and we have gotten burned by it……have to be extra on guard to help counteract “her”…..
we be so sad today. Anything in the direction of “littles” takes a step of bravery for me…..but I am able to do it because I know somebody (ya’ll!) are able to “hear” me and “understand” me……Thanks!